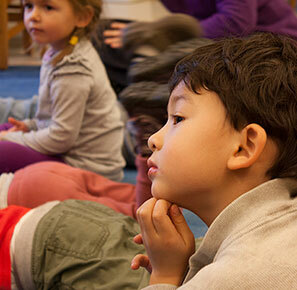 The early goals of the Bluebird program are to help children become comfortable in a group, become accustomed to the routines of school life, and get to know and trust adults other than their own parents. Early in the school year, children tend to move rapidly from activity to activity and we encourage them as they follow their own interests. As the school year progresses, children show lengthening attention spans and learn to work together. As this ensues, more structured activities are offered. 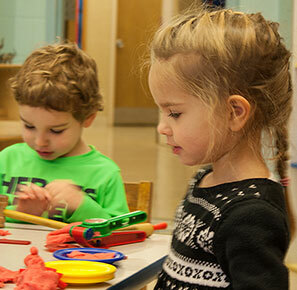 Throughout the school year, activities are selected to provide stimulation for each child’s emotional, social, physical, cognitive and creative development. As children engage in projects and activities within the classroom, we also encourage using their “words” to communicate, taking turns, and showing respect for each other. 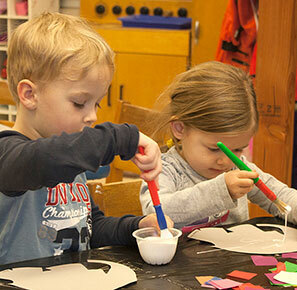 Regular classroom activities include: music and rhythm, art projects, imaginative play, science and nature exploration, literature, outdoor exploration and play, and large-motor activities. Bluebirds may attend school three, four, or five mornings a week. Each day there are two parents co-oping in the class and no more than fourteen children in attendance. For information on co-oping responsibilities for Bluebird families, please see the Admissions and Our Approach sections.